After a difficult and uncertain time for Triton and GMC (Global Machinery Company), it is good to see these companies under new ownership and their products back on the market. 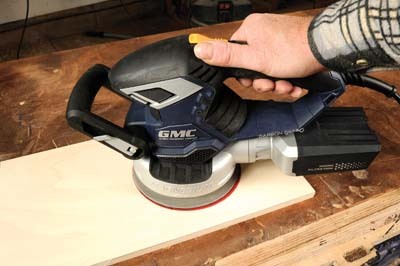 The tool on test is one we always seem to need in the WPP workshop â€“ a random orbital sander, the ROS150CF 460W machine. 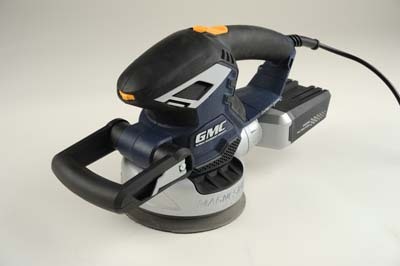 Despite, or because of, its size, it handles very well, with grip surfaces having plenty of thick rubber overmoulding to damp out vibration â€“ although the front grip lacks this. The switch on top is helpfully ambidextrous and the front grip handle has a very easy-to-use lever for angle adjustment over a wide range. When plugged in, a red neon shows the tool is live. The dustbox is a twist fitting like a bayonet lightbulb, and the collar separates from the box very easily. It claims to give micro-filtration of dust particles. This tool seems to be a little slow to reach full revs but once it does so, with an 80grit disc attached, it is very effective. The apparently slow rotation speed is belied by the relatively quick and pleasing result. I tried it on a stained piece of pine with 80grit and got a completely bare, smooth result. Using 180grit on the stain gave a pleasing weathered look, that with more work produced a lovely clean finish. There was little vibration and the motor was quiet. May manage to give professional models with a similar motor wattage and disc size, a run for their money.